VARIO chemistry pumping units combine adaptive process control with clean and whisper-quiet vacuum. Constant evaporation result in solvent recovery next to 100%. Quietness and lifetime of diaphragms and valves are unmatched. Gas and vapour wetted parts are made using appropriate chemically resistant fluorinated plastics. For distillation concentration and drying: fully automatic adapation of the vacuum to the actual process parameters. 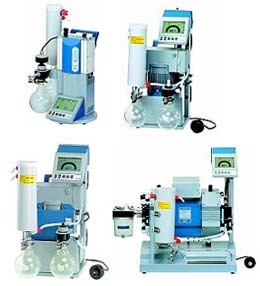 VARIO chemistry pumping units always consist of vacuum pump and vacuum controller with gauge head and accessories.